This site covers country music and opry events in eastern Kansas and Western Missouri, essentially a very large area around Kansas City. The events listed on this site are frequently part show, part jam. Their calendar is full enough to keep you busy every night of the week all month long every month of the year if you are willing to drive quite a bit. When I moved to the Kansas City area in 2000, I discovered a quiet lake area with some rural development near it. I was ecstatic to find out that an a local Opry was going to be opening up in that shopping plaza, Rutlader Outpost south of Louisburg, Kan. These shows were really neat because there was so much variety in them from honky-tonk and contemporary country to gospel and bluegrass. All of the singers in the Middle Creek Opry show would chat with the audience inbetween shows. Guests would come on the show, and sing their own songs/cover song. It was really neat because it gives country performers a venue without the wild life of the honky-tonk. As I began working a lot of Friday nights, I missed the local Opry and unfortunately, didn't get a chance to visit the dozens of other Oprys scattered throughout the American heartland. But it was refreshing to know that a gentleman from Kansas started a website, Missouri-Kansas Opry, and the local country music scene is alive and well in the Kansas City area. These Oprys are not affiliated with the Grand Old Opry, but they're still excellent sources of country entertainment. 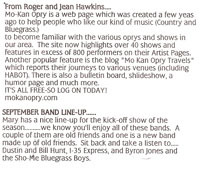 Mo-Kan Opry and Country Music Site by Roger and Jean Hawkins, check out the slide show! !